Department of Orthopedic Surgery, Kosin University Gospel Hospital, Busan, Korea. With recent advances in treatment methods for osteosarcoma, a combination therapy of surgery, chemotherapy and radiotherapy has greatly improved long-term survival rate [1-3]. Traditional treatment method for patients with osteosarcoma mainly include limb-salvage surgery and amputation. Controversial opinions remain regarding the outcomes between the two methods. In recent years, however, an increased number of studies have reported that the treatment outcomes of limb-salvage surgery have improved [4-6]. Moreover, limb-salvage surgery has become increasingly common. Since the 2000s, its application has been almost popularized. The 5-year survival of patients underwent limb-salvage surgery has increased to 60% - 70%. On the other hand, orthopedic surgeons confront challenging problems related to limb-salvage surgery such as complications associated with the delayed chemotherapy (secondary malignancy or infertility) and postoperative complications such as infection and the mechanical failure or instability of the metal prosthesis [7-9]. Many studies have reported on the functional status of the extremities on the affected side in long-term survivors from osteosarcoma [10-13], however, there are insufficient about the quality of life [14-20]. So we conducted this study to evaluate the quality of life in longterm survivors from osteosarcoma. The goal of this study is to examine which limb salvage surgery is the most effective in improving the long-term survivors’ quality of life. Moreover, the correlation of limb function and QOL was studied to clarify the effects of limb function on the long term QOL. Of the patients who were diagnosed with osteosarcoma at our medical institution from December 1989 to December 2007, 96 cases were long-term survivors who could be followed up during a minimum period of six years. Of those cases, 47 were available for a questionnaire survey. Informed consent was obtained from the patients before conducting the questionnaire. These cases had a mean age of 31.2 years, 25 were men and 22 were women. Of the 47 cases, 7 underwent amputation and the 40 had a limb-salvage surgery. Of the cases who underwent limb salvage surgery, 25 underwent tumor prosthesis replacement, 6 had allografts, and 5 had recycling autografts (2 extracorporeal irradiation and 3 pasteurization). According to anatomical region, there were 6 cases involving the upper extremities (3 cases of the proximal humerus, 2 cases of the distal radius and one case at the scapula) and 41 cases involving the lower extremities (23 cases of the distal femur, one case involving the femoral shaft, 13 cases involving the proximal tibia, two cases at the distal tibia, one case at the patella and one case at the calcaneus). As a tool for assessing the quality of life in long-term survivors, the SF-36 health questionnaire was performed using telephone and outpatient interviews. The questionnaire has been widely used worldwide, and its validity has been well demonstrated in studies. It is therefore considered a valid and reliable questionnaire . It is a simple questionnaire consisting of only 36 questions. National standards of the Korea are also available . For these reasons, the SF-36 was considered to be appropriate for the QOL assessment of long-term survivors of osteosarcoma and was selected for our evaluation. The SF-36 is composed of eight parameters: Physical functioning (PF), physical role (PR), bodily pain (BP), general health perceptions (GH), vitality (VT), social functioning (SF), emotional role (ER) and mental health (MH). Following the questionnaire survey, scores on the eight parameters were converted into values that were adjusted to a mean of 50 points and a SD (SD: standard deviation) of 50 points. Based on a cut-off value of 50 points, the results of the current study could be interpreted and analyzed . A total of 47 long-term survivors were divided into two groups: the amputation group (n = 7) and the limb-salvage surgery group (n = 40). This was followed by a comparison of the scores on the SF-36 health questionnaire survey between the two groups. In addition, we also classified the patients who underwent limb salvage surgery into cases of tumor prosthesis replacement, allo-bone graft, autologous bone graft (extracorporeal irradiation, pasteurization). Then, we evaluated a comparative analysis of these groups. To assess the function of the extremities in long-term survivors, we used the American Musculoskeletal Tumor Society (MSTS) Scores . The MSTS score is widely used for the evaluation of affected limb function. Lower limb function was evaluated according to six parameters: pain, function, emotional acceptance, supports, walking and gait, each of which was scored with a full mark of 5 (total of 30). Upper limb function was evaluated according to six parameters: pain, function, emotional acceptance, hand positioning, dexterity and lifting ability, each of which was scored with a full mark of 5 (total of 30). Thus, we compared the functions of extremities between the amputation group and the limb-salvage surgery group. In addition, by comparing the methods of limb-salvage surgery, we attempted to determine which is the best treatment option on limb function. To identify the correlation between each parameters on the SF-36 health questionnaire survey and the MSTS Scores, we used the Pearson’s correlation coefficient. Thus, we attempted to analyze the correlation between scores on the SF-36 health questionnaire and the MSTS. Figure 1. QOL of long-term survivors of osteosaroma. 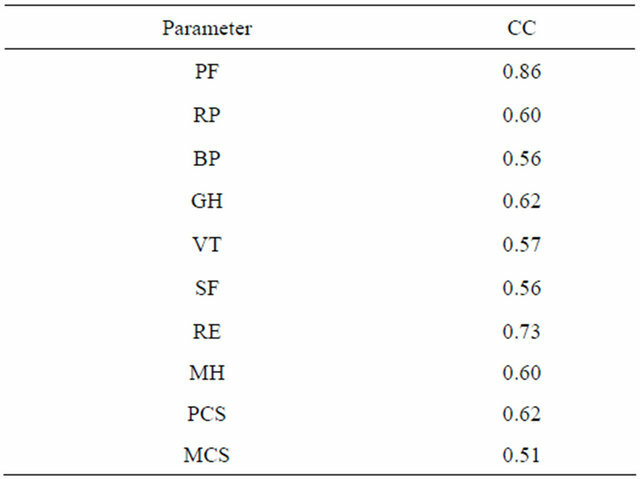 The QOL was assessed using 8 parameters. For each parameter, the mean of the national standard of the Japanese is adjusted to 50 points, and the standard deviation to 10 points. PF: physical functioning, RP: physical role, BP: bodily pain, GH: general health perceptions, VT: vitality, SF: social functioning, RE: emotional role, MH: mental health. Table 1. Comparison of the QOL between the limb-sparing and amputation groups. SD: standard deviation, PF: physical functioning, RP: physical role, BP: bodily pain, GH: general health perceptions, VT: vitality, SF: social functioning, RE: emotional role, MH: mental health. mean SF-36 scores were 63.1 in the tumor prosthetic replacement group, 58.4 in the allo bone graft group, 51.6 in the pasteurization group, and 60.7 in the extracorporeal irradiation group. 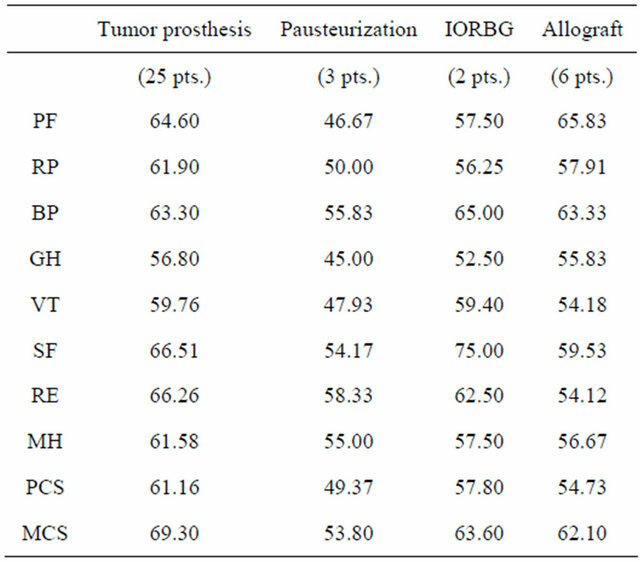 These results indicate that the tumor prosthetic replacement group of limb salvage surgery was the highest score(Table 2). According to primary sites, mean SF-36 scores were 69.3 in the patella, 67.4 in the humerus, 66.9 in the distal femur and 66.7 in the proximal tibia. Overall, mean MSTS scores, a measure of the function of the extremities, were 23.8 (15 - 28) in a total of 47 cases. In addition, the average score in the limb salvage surgery group was 24.35 (15 - 28) and 21.28 (19 - 23) in the amputation group. The mean was 24.5 in the tumor prosthetic replacement group, 25 in the allo bone graft group, 23 in the pasteurization group, and 21.5 in the extracorporeal irradiation group of recycling autologous bone graft. Table 2. SF-36 according to type of surgery. PF: physical functioning, RP: physical role, BP: bodily pain, GH: general health perceptions, VT: vitality, SF: social functioning, RE: emotional role, MH: mental health, PCS: physical component summary, MCS: mental component summay. (MCS) had a Pearson’s correlation coefficient of 0.51, corresponding to a relatively lower degree of correlation (Table 3). Table 3. Correlation between the MSTS score and SF-36. CC: correlation coefficient, PF: physical functioning, RP: physical role, BP: bodily pain, GH: general health perceptions, VT: vitality, SF: social functioning, RE: emotional role, MH: mental health, PCS: physical component summary, MCS: mental component summary, statistically significant. generic tools, we used the SF-36 health questionnaire for the current study. It has been translated in many different languages and customized to each country. In addition, its translated versions have been validated and revised. Based on the telephone interviews and self-reporting questionnaires, it can be used in a large patient population and can give an unbiased comparison of the psychological and physical factors, as well as evaluate quality of life in comparison with other disease groups. We evaluated the quality of life in long-term survivors from osteosarcoma in patients at our medical institution. 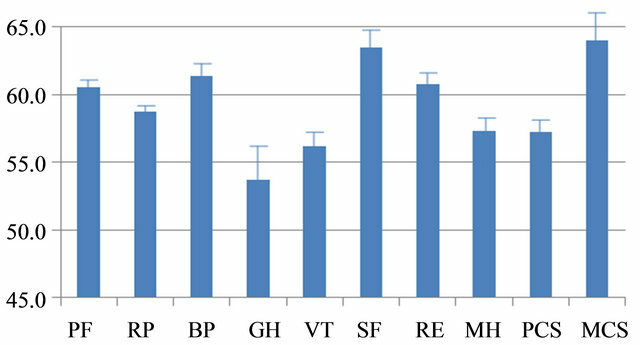 The mean quality of life scores were higher on a total of eight parameters as compared with the standard values on the SF-36 health questionnaire. But 50.5% of eligible patients enrolled in the current study were not cooperative with the questionnaire survey, which might have affected our results. This should be considered. A majority of eligible patients who were cooperative with the questionnaire survey had positive responses. These positive attitudes might have contributed to an improved measure of quality of life. 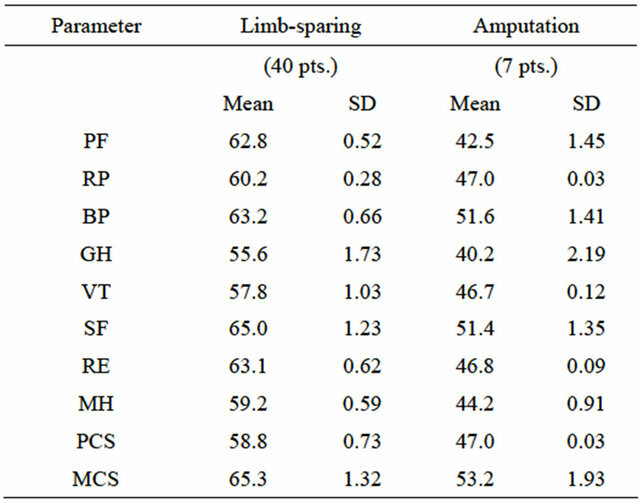 All eight parameters had higher scores in the limb salvage surgery group than in the amputation group. To date, studies have also been conducted to compare the degree of quality of life between patients undergoing limb salvage surgery or amputation. Many of these studies have shown that there is no significant difference in the longterm quality of life between the two groups [15-18,20]. In contrast to these reports, our results showed that the degree of long term quality of life was higher in the limb salvage surgery group compared with the amputation group. Some studies have reported that the MSTS score did not correlate with QOL [19,22]. But in this study, there was a significant correlation between the MSTS scores and the physical component summary (PCS) on the SF-36 health questionnaire. But there was lower correlation between the MSTS scores and the mental component summary (MCS) on the SF-36 health questionnaire. These results indicate that the mental health quality of life is not wholly dependent on the function of the extremities. It was shown, however, that the function of the extremities has a significant correlation with the quality of life to an extent. Previous studies have shown that limb-salvage surgery produces a variety of complications that can lead to poor quality of life. Our results are of significance, however, in that they showed the limb-salvage surgery restored the function of the extremities and this led to an improved quality of life. We had the satisfactory results on all the eight parameter of the SF-36 health questionnaire. Despite many complications of the limb salvage surgery, the tumor prosthetic replacement is considered an effective surgical method in improving the quality of life. Excellent functions of the extremities would lead to a good quality of life. T. Yonemoto, S. Tatezaki and T. Ishii, “Knee RotationPlasty for Malignant Musculoskeletal Tumors Occurring around the Knee Joint,” Anticancer Research, Vol. 21, No. 1B, 2001, pp. 717-722. *Note: This study was supported by a grant from Kosin University College of Medicine (2011).